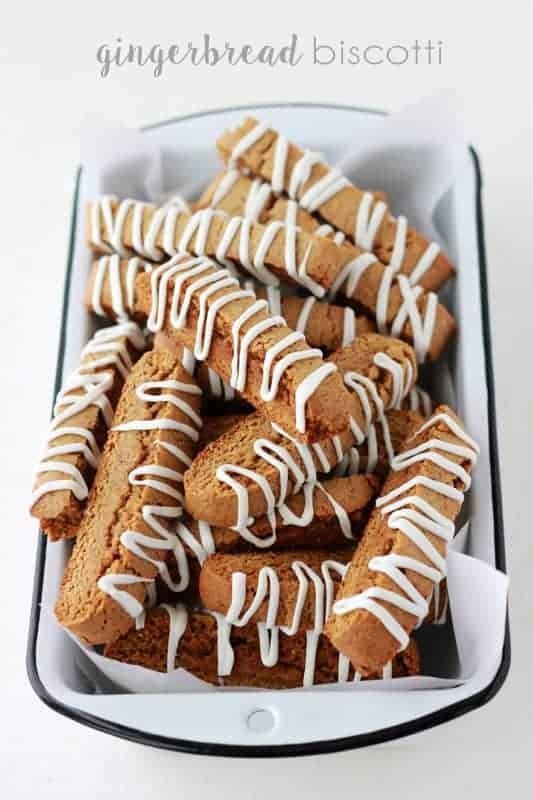 Gingerbread Biscotti. 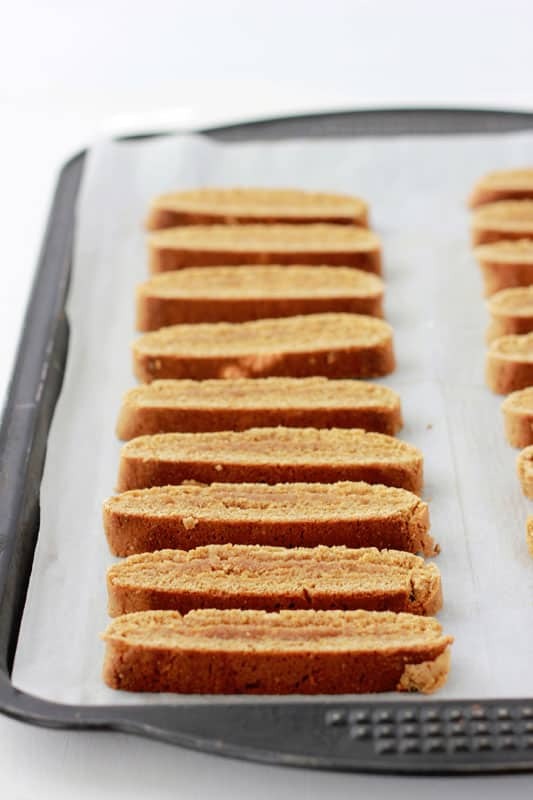 Enjoy this holiday biscotti recipe with a warm cup of coffee for the perfect morning treat! We are only 15 days away from Christmas! I am in full holiday baking mode. Making neighbor cookie trays is a tradition we look forward to every single year. I love compiling a list of cookie recipe ideas and having my six year old help pick three or four “winners.” He loooooves our baking day. It is a chance for both of us to bond in the kitchen and for him to share some of his not-so-helpful baking hints. 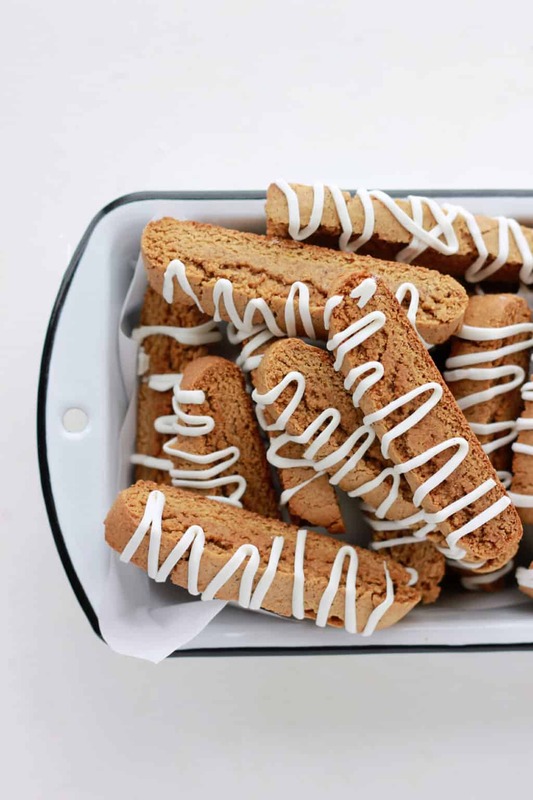 Biscotti is the best. When you combine it with the sweet flavor of gingerbread you are left with a crunchy cookie that is packed with holiday cheer. These little goodies are ideal for packaging and/or shipping because they hold up well and last a little longer than your typical soft cookie. Baking these twice is what gives these their crunchy texture. Try dipping them in cocoa or coffee to soften them up or enjoy as is! Like this recipe? 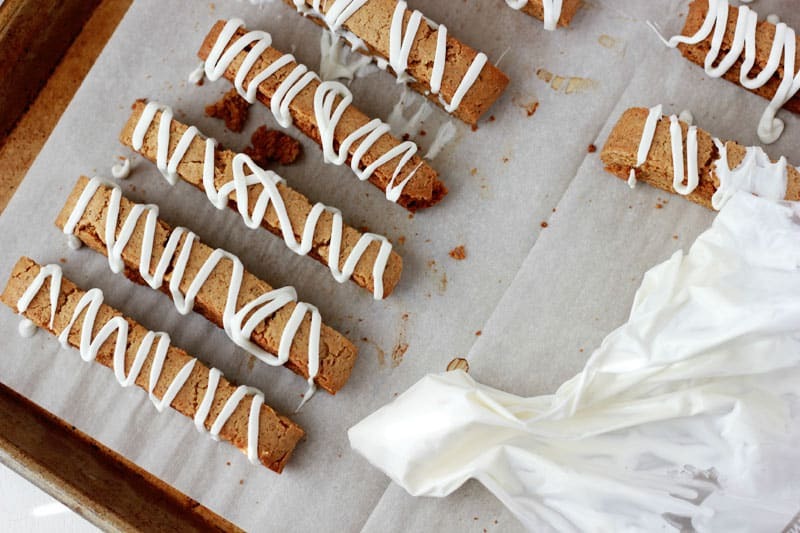 You will love my Almond Biscotti, Cake Mix Biscotti, and Candy Cane Biscotti! Preheat your oven to 350 degrees. Line a cookie sheet with parchment paper and set aside. Combine the butter and sugar in the bowl of an electric mixer. Beat until combined and fluffy. Add the eggs, molasses, and vanilla extract. Whisk together the flours, baking powder, ginger, cinnamon, cloves, nutmeg, and salt in a separate bowl. Mix into your wet ingredients until fully incorporated. Divide your dough into two equal parts. Shape each piece into a roll slightly shorter than the tray. Press down to 1/2 inch thickness. Bake for 25 minutes. Let the cookies cool 15 minutes. Use a sharp knife to slice 1/2 inch pieces and place flat onto your tray. Bake 10 minutes on each side at 325 degrees. I lover gingerbread so much I created a pinter estate board for it. Of course I pinned this to it. Yum!! Gingerbread is looking like the theme for this year! I’ve got some pancakes coming up soon! What kind of icing did you drizzle on the top?